The Crawford Fund’s SA State Committee is proud to have sponsored two 2016 scholars to attend this year’s annual conference on ‘Waste Not, Want Not: The Circular Economy to Food Security’. In addition, the support of Australian Academy of Technology and Engineering (ATSE SA Division), Australian Agricultural & Resource Economics Society (AARES) and Elanco Animal Health allowed four more scholars to attend the 2016 conference. With a background in ecology and environmental management, I made the move into agriculture for my PhD in which I am investigating the role of soil ecology in plant phosphorus acquisition. While my current focus is on Australian cropping systems, I have hopes to move into the international agricultural development area. Attending the Crawford Fund conference gave me the opportunity to begin delving into the field of international agricultural development, and ultimately led to me confirming my goal of moving into this area. The highlight of the conference for me was meeting and connecting with inspiring people. The people I met ranged from fellow students to senior researchers, and from people interested in agricultural science, such as plant breeding, to people working on the social and economic aspects of agricultural development. It was fantastic to be surrounded by people with great enthusiasm for the work they do; all of them looking towards providing a food secure world. While it was interesting to start the conference on food waste with Karen Brookes outlining how food waste is only ‘part of the problem’ and there is a need for companion measures, it soon became clear that food waste is, indeed, a very large problem in itself. With up to 42% of food being wasted in some countries, this is an important issue to be tackled for a food secure world. However, I can’t help but be optimistic, given the range of solutions presented throughout the conference. Uber tractors and phone apps that help identify crop diseases, reducing on-farm losses; tracking devices to reduce losses during transport; and nutrient recovery technologies to recycle nutrients from waste back into crops were just some of the solutions presented. If all of these ideas are realised, I believe food waste can be drastically reduced. In addition to the conference talks on food waste, there was also the chance to attend the scholars’ activities, which were more focused on career development. One of the highlights from this was the advice from Louise Fresco to be a ‘Jack of all trades, master of one’. This has led me to closely examine the role I can play in agricultural development, and what I can be a master in. Other great advice included: always be working on more than one thing; always be looking for a job; and say yes to opportunities when they arise. However, the idea that has stuck with me the most from these activities was the idea that my research is just one brick in a great wall. When doing a PhD, it is easy to lose sight of the big picture, and easy to begin thinking that your research will never amount to anything, but this idea of everyone’s research being but a single brick, has grounded me and reaffirmed my purpose. I would like to sincerely thank the Crawford Fund for sponsoring my attendance at the conference and scholars’ activities, and look forward to future Crawford Fund events. 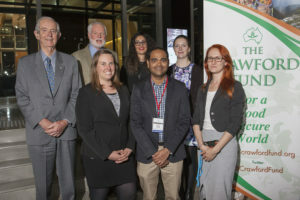 Attending the 2016 Crawford Fund conference in Canberra provided me the opportunity to hear from world leading institutes working to address the current global food issues and reduce food loss and waste. As it is well defined by several speakers, the current issue of food loss is complex and requires a multidisciplinary approach. Attending the conference as one of the young scholars offered the prospect to meet, network and discuss my research interest and ideas with global leaders in food loss and waste management which will definitely benefit my future career direction. From my research perspective the most thought provoking sections of the seminar were the sessions focusing on the on-farm and post-harvest food losses. Particularly the talks presented by representatives of Wageningen University and Research Centre, World Resources Institute, Indian Council for Research on International Economic Relations and World Food Programme. The conference structure and the dynamic speeches provided a clear update on what is on demand in developing and developed countries. The “big picture” was interestingly diverse in terms of demand, production and management. Global food direction toward “the future of our food” and the role of research and innovation in creating it was presented well throughout the conference. This presented me a valuable insight toward future research and development in food engineering technologies. Reminding all in attendance “the complex picture of on farm loss” in both developed and developing countries according to the most recent studies was a great start on the significance of the problem and the need for quick actions. The examples of what short and long term solutions have been implemented in developed countries were presented which was an eye opener for me. During the lunch time discussion these aspects were highlighted and reviewed in depth again. Accentuating the importance of thinking out of the box by bringing innovating ideas to save on waste and loss in different stages of agri-value chains was another important message conveyed throughout the sessions. Introducing methods, combining new and available technologies with current methods and exploring the possibilities for each case based on the condition, size, climate and culture of each region was another important message presented and discussed. I believe most attendees would agree the greatest challenging speaker was from the world Food Programme. The importance of capacity building and creating the knowledge and technology base among the local communities in developing countries was presented with evidence of previous attempts as an effective step toward global sustainable the food production. The Crawford Fund conference also provided the opportunity of discussion with mentors and scholars with similar interests to plan for future project developments and collaborations. The advice and suggestions I have received from the speakers in 2016 Crawford Fund conference provided me a rich knowledge on the importance of research in food industry. I wish to express my deep gratitude to the Australian Academy of Technology and Engineering (ATSE SA Division) for funding my scholarship to attend the 2016 Crawford Fund conference. As a graduate agricultural science researcher who doesn’t have a farming background or international work experience, the conference really opened my eyes to the role that international agricultural research plays in working towards a food secure future. The support and encouragement from Crawford Fund committee members and former scholars was also fantastic. It was clear that small targeted steps and focussed projects build momentum over time and is perhaps a sensible starting place for someone like myself to contribute. Whilst the conference was focused around alleviating food loss and food waste, the actual breadth of topics discussed, both formally by seminar presenters and more informally during networking opportunities in coffee and lunch breaks, allowed me to develop a ‘big picture’ perspective. I learnt about how others play their collective part in solving problems of food security. I was energised and inspired that my own skills and experience could be applied to delivering very practical solutions. As a trainee plant pathologist, I could offer basic crop health and plant disease diagnostic support to small holder farmers in developing countries. In fact, this is what my wonderful Conference Mentor, Ms Madaline Healey and the amazing Prof. Lester Burgess convinced me I could do in Laos right now! I was imbued with confidence and enthusiasm by spending time with Ms Healey who assured me that even with my limited experience, I can still contribute positively to farmers in developing countries. Indeed, hearing about all the different backgrounds of the conference attendees reinforced my internal motivation to one day work directly in international agricultural research in-country. The well-organised Scholar-specific activities provided a fantastic networking opportunity allowing me to get to know many of my scholarly peers and other Crawford Fund mentors and members. Everyone I spoke with was encouraging, supportive and seemed as equally enthusiastic about me being there to participate in the conference as I was to be there! Every person exuded a fire in their belly about playing their part to help alleviate food insecurity, whether they be a plant pathologist like myself, an economist, a social researcher or a nutritionist, to name just a few of the vocations I came across. I thoroughly enjoyed listening to Prof. Louise Fresco speak, who advised scholars to be a good story teller, to be interdisciplinary, to keep your eye on your long term career goal(s) and that finding balance between private, government, NGO and scientific research in our work will be invaluable. I’ve no doubt that her recommendation to ‘become a jack of all trades and master of one’ will be a life-long mantra for myself and the other 2016 conference scholars. The advice from Mr Andrew Campbell to be ruthless in cultivating mentors, to take time to ‘sharpen your sword’ and that unlikely partnerships can be extremely powerful will also stay with me for a long time to come. All the speakers at the conference made it clear that taking action is key to achieving real success. This was brought home by Mr Simon Costas’ incredibly direct presentation that was equal parts tear jerking and applause-worthy. He drilled the message home that if you have the means and the passion to do something, then act to make it happen. My plan? To continue building my capacity in the field of plant pathology so I can provide farmers with practical scientific solutions to reducing in-crop and post-harvest losses, thereby contributing to sustainable food production, increased financial stability and food security. The Crawford Fund conference 2016 is by far one of the best conferences I have ever attended. With the very well-organized and enriched program, it provided me with not only novel knowledge and valuable information about working in agriculture development but also opportunities for networking and initiating collaboration. The combination of distinguished, passionate and easily accessible speakers as well as enthusiastic and supportive mentors created a very friendly and encouraging atmosphere. As a plant geneticist, attending this conference helped me to have better understanding about the food waste and loss in the world and new areas that I can apply my expertise to help improve food security in the world. All of the talks presented at the conference were highly interesting and informative, however, there were three talks that impressed me the most. The first one was from Dr Karen Brooks from CGIAR Research Program on Policies, Institutions and Markets, International Food Policy Research Institute. From her talk, I have learnt that food waste and loss (FWL) is highly context-dependant and tightly linked to both social and environmental issues such as poverty or gas emission. FWL varies between a developed and a developing country, among commodities, or different stages along the line between production and consumption, etc. Hence, there will be no one-fits-all solution but the FWL issue must be looked at in a specific context. The second excellent talk was given by Dr. Ashok Gulati from Indian Council for Research on International Economic Relations. His talk stressed that as FWL is one third of the total food produced globally, reduction in FWL can bring multiple benefits such as poverty reduction, higher income for the producers and lower cost for consumers, as well as protection of precious resources and the environment. Dr. Gulati showed some interesting innovating solutions and interventions that were applied and showed promising results, but again, this may be relevant only for India. Personally, the most impressive talk at the conference to me was from Simon Costa (World Food Program). He presented a striking figure of a pot receiving a lot of inputs, but having so many holes in the bottom to alarm us of the consequence if we do not pay attention to preventing FWL. In addition, he showed that if the FWL problem is tackled in a correct manner (in storage equipment and training for farmers in this case), then even a modest amount of money can bring about a huge change to a vast number of people. And another advantage of the program he launched was that once it was successful, then the system runs continuously by itself so he did not have to keep helping the farmer households in Africa. It reflects the saying from Henry Ford that “Time and money spent in helping men to do more for themselves is far better than mere giving”. Another highlight of the conference was the program for scholars. The program was split into two days, which allowed the scholars to digest all the information provided in the first session gradually and participate more efficiently in the second session. This program gathered the many people who were successful in participating in international agriculture development projects overseas, and thus promoted experience sharing and dispersed fruitful information of this field to the audience and scholars in particular. In addition, the program maximized the interaction between mentors and mentees, as well interactions among scholars and between scholars and speakers and invited guests. Therefore, I was be able to raise my voice and talk with various like-minded people. It was also extremely helpful to me to learn about real experiences and practical advice from presenters. I would like to express my sincere thanks to the Crawford Fund for giving me an opportunity to attend this conference and helping me become clearer, more confident and determined in working for international agriculture development. If one wants to be informed, inspired, and involved in working for agricultural development, then this conference is the best choice. Being a researcher in food and agriculture, ‘food security’ is a term that I come across frequently through books, articles, newspapers and interactions. It is a complex phenomenon that is challenging the global community. The concepts of food waste and food loss form a major part in the achievement of food security for us, and in that light, this year’s Crawford Fund’s annual conference hit the nail on the head with regards to facilitating discussion and interaction on these issues. Prof. Fresco’s opening remarks of the Sir John Crawford memorial address, where she started her speech by saying ‘food is not fixed in time’, made me think. Food is not fixed in time, yet we have been poor managers of our resources over the years as human civilization has progressed and today stand at a situation where sustaining our biggest source of energy has transformed into our biggest problem coupled with environmental degradation. I also agree with Prof. Fresco’s view that we need to define agriculture in a much broader context underpinned by effective communication and impactful knowledge sharing across societies beginning at the school level. This is especially important if we want our future generations to be involved in agricultural activities. Differentiation between food waste and food loss helped put a lot of things in perspective and clear some misconceptions. The first step in tackling food wastage is identification of where it happens in the chain and who takes ownership of the waste. Should the economic ownership of the waste belong only to the government? Or do actors in the value chain need to take responsibility for it? There is a need to develop efficient mechanisms of handling food loss at various stages in the value chain. Dr.Ashok Gulati of Indian Council for Research on International Economic Relations (ICRIER) suggested that we have to change our thinking from ‘farm to fork’ to ‘plate to plough’. This top down approach to the chain is essential in identifying loopholes in the chain where food is being wasted intentionally and where food is lost unintentionally. Along with extension services for farmers, I believe there needs to be equal targeted efforts towards educating the consumer. In developed countries, where the majority of food wastage happens at the consumer level, the consumer is exposed to a wealth of information from various sources which can result in unpredictable consumer behaviour driven by opinions and influences from various sources of information. Even in developing countries with rapid urbanization, the consumer is increasingly being exposed to complex information channels about food and food products. This information overload tends to create confusion in the minds of the consumer. This issue is directly related to food wastage at the consumer level and there is a need to have efficient mechanisms for targeted consumer awareness at every stage. Whilst ensuring that we help farmers to become ‘smart producers’ we also need to help buyers become ‘smart consumers’. The role of supermarkets is crucial in this. The key message for me from the conference presentations and speakers was the need for initiating activities that will potentially lead to cross-sectoral collaboration across the food and agricultural sector. The mentor-mentee arrangement initiated this year should certainly be continued here after. I was fortunate enough to be paired with an experienced economist like Malcolm Wegener who advised me and helped me in networking. The interactions I had over the two scholar days have been a validation for me that I am on the right career path. I want to thank AARES (Australian Agriculture and Resource Economics Society) for this opportunity. I was fortunate enough to be sponsored by Elanco to attend the 2016 Crawford Fund conference “Waste Not, Want Not: The Circular Economy to Food Security”. The conference outlined the areas of food waste and loss in both developed and developing countries, and highlighted that global food security going forward will not just be an issue of increasing the yield of food produced but actually lies in the responsible use of the food that is already produced. Dr Karen Brooks stated that access to food is more important than volume globally, which was really interesting for me to hear as my studies have always focused on increasing volume of food produced. It also highlighted that food waste is a global issue, and although the issues faced by developed and developing countries are vastly different, it is an issue that affects us both. I found quite confrontational, that we cannot simply produce more food. Given the remaining land capacity on earth and the maximum efficiency of existing farms and the environmental impacts of farming, we cannot rely on increased farming to feed the growing population. However, now that my eyes have been opened to how much food and nutrients are wasted across the globe it gives a spark of hope that we will be able to feed the world by better utilising the existing resources that we have as well as increasing outputs from farms. Although I found this information comforting, it again leads to feelings of distress, as it is still such a large issue to tackle in how we can actually reduce food waste and loss. For me the best part of the conference was that there was a room full of intelligent likeminded people that were all focused and passionate about this issue and actively working in this field, and that was able to quell my feelings of distress, knowing that this issue is a work in progress, it is solvable, and people are dedicated to tackling it. One thing that was repeated throughout the conference was the fact that in developing countries a lot of waste lies in the farming and market practices used that don’t allow for longevity of produce. For that in developed countries, the issue lies further along the chain, in the hands of consumers that let food go to waste in their homes. Although incredibly obvious once stated, it did challenge my view on global food security as I have often been quick to think “how can we help developing countries with food waste” when in fact this issue is much closer to home and in fact is in our own fridges! To me this was actually a great discovery, to know that this is an issue that can and will be tackled at a local level as well, and that it truly is a global issue that we all face. It was also important to realise that when helping in developing countries, the issues that they face may be similar in nature but are in fact very different, and cannot be fixed with a standard solution; each issue needs to be considered individually. The main take away for me from the scholars’ sessions that will continue to influence my day to day life is that research and practice are good; it doesn’t have to change the world, but it can change someone’s world for the better. This conference has enabled me to make connections that will help me achieve my goal to work in international agriculture development, as well as local agriculture, to improve global food security. It highlighted to me that this field of work is not always about a scientific breakthrough, but it is about having a moral compass and growing as a person by putting yourself out there to be of use to the world, and that this is achievable for young scientists to get involved and make a difference. It was such a pleasure to meet all the people that currently work in this field and all the other young scholars that I may find myself working alongside in the future.